The hand-foot-mouth syndrome is, in most cases, a mild and benign condition that spontaneously disappears after a few days without causing any complication. The biggest problem is often the risk of dehydration because the sore throat can make the child stop accepting food and liquids. 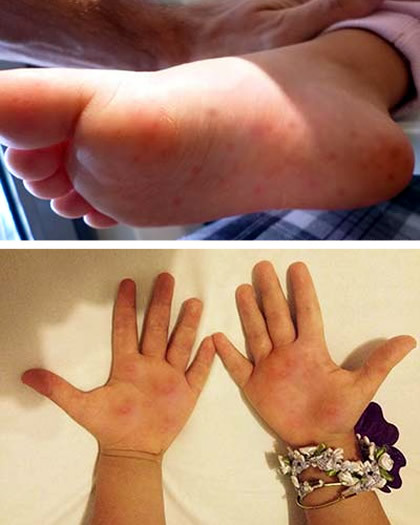 Of all the major causes of rashes febrile (fever + red spots on the skin), hand-foot-mouth disease is one of the easiest to diagnose because of its typical involvement of the oral mucosa, soles of feet and palms of hands. Hand-foot-mouth syndrome is a contagious viral infection caused usually, but not only, by Coxsackievirus A16. HFMS of cases can also be caused by other serotypes of coxsackie viruses, such as Coxsackievirus A2, A4 to A10, B2, B3 or B5. Other viruses, such as Echovirus 1, 4, 7 or 19 or A71 Enterovirus may also cause the same syndrome, very similar signs and symptoms. The clinical picture is usually self-limited and short-lived in all serotypes, but the hand-foot-mouth syndrome caused by A71 Enterovirus can be more dangerous because it can complicate with cases of encephalitis, meningitis or myocarditis (inflammation of the heart muscle). HFMS often occurs in the children under five years, but may eventually affect adults. Having contact with respiratory secretions, usually through coughing or sneezing. Shake hands with someone infected. Eating food prepared by an infected person who has not made the proper hygiene. Contact with toys or objects that may have been contaminated by dirty hands. Changing diapers of infected children. Generally, the phase of greater spread of hand-foot-mouth syndrome is during the first week of illness. However, even after curing, the patient can remain eliminating the virus in the stool, what remains infectious for several days or even weeks after the symptoms have disappeared. Most adults that is contaminated with the virus Coxsackie not develop symptoms, but they can be asymptomatic virus transmitters. The incubation period of HFMS usually 3 to 6 days. The first symptoms to appear are often the sore throat and fever, which is at about 38°C. Malaise and loss of appetite are also common. At first, the disease is much like any common virus frame, being impossible the clinical diagnosis at this stage. A day or two after the first symptoms begin to appear the characteristic lesions that give the name to the hand-foot-mouth disease. The mouth lesions begin as red spots which turn into small blisters and then to painful ulcers, similar to common thrush. These sores usually appear on the tongue and on the insides of the lips and cheeks. The palate (roof of the mouth) may also be affected. One or two days after the appearance of the mouth lesions also begin to show lesions on the palms and soles of the feet. The wound starts as small blisters with a red halo around it. The lesions tend to have from 0.1 to 1 cm in diameter and may rupture, releasing a liquid which is very contagious. Buttocks, thighs, trunk arms and face may also have some injuries. Importantly, not all people infected with Coxsackie virus develop the full clinical picture of HFMS. 75% of patients have a complete syndrome, but the rest can only have lesions in the mouth or skin. For adults, the vast majority of individuals who come into contact with the virus Coxsackie do not develop any symptoms. The hand-foot-mouth syndrome typically lasts for 7 to 10 days and heal spontaneously, without the need of treatment without causing complications in most cases. The most common complication is often dehydration, because in addition to the malaise, neck pain is very strong, and children can stop accepting food and liquids. The case caused by HFMS A71 Enterovirus also usually have a benign course, but there is an increased risk of complications, such as myocarditis, meningitis or encephalitis. In patients presenting the typical fever, oral ulcers and lesions on the palms and soles, the diagnosis is made easily, without the need for further laboratory research. In atypical cases, if the doctor feel the need to make the diagnosis, identification of the virus can be obtained by examination of feces or throat or skin lesions secretions. There is no specific treatment for HFMS. And not need, because the disease is usually self-limited. In general, sufficient anti-inflammatory and pain-relievers to control the symptoms of pain and fever. It is important to keep children well hydrated. In more severe cases, especially in children who refuse food and spend at risk of dehydration, hospitalization may be required. Infected people should stay at home. Children should not go to daycare or school, and adults must miss work until all symptoms have disappeared. Because the virus can still be eliminated in the stool even after curing the symptoms, it is important to guide the patient to wash their hands often, especially after using the toilet and before handling food. In nurseries, we need to be very careful with hand hygiene when changing diapers, so that professionals do not transmit the virus from one child to another. Street clothes and bedding can be contamination sources (especially if there is secretion of skin lesions) and should be changed and washed daily. Toys should also be washed frequently. There is still no vaccine against hand-foot-mouth disease, but there is very promising and advanced studies in progress.